To celebrate the re-launch of its brunch, BOCA is offering every group of 4 brunch-goers a 5th seat absolutely free on THE GRAPE FESTIVAL FRIDAY BRUNCH and on all other packages on Fridays & Saturdays. Valid until March 31st 2019. BOCA has now opened its doors every Friday and Saturday to food lovers by adding The BOCA ala carte brunch, giving patrons a gateway to the Mediterranean for the day. Forget your traditional weekend brunch packages, BOCA offers Dubai a weekend feast where customers can expect a more casual, laidback ambiance than your typical brunch, with succulent dishes highlighting its signature sharing concept. 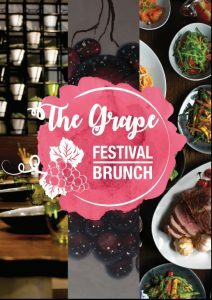 Join us at BOCA’s new grape lovers’ Friday brunch: pick up a glass and visit stalls set up around BOCA’s olive tree terrace sampling more than 20 different grape varieties from old and new worlds. Talk to our sommeliers and take notes using your own weekly changing grape-list & tasting wheel guide all while enjoying BOCA’s new a la carte brunch spread of new menu items and BOCA classics.